Hello and welcome to our new series of Korean Writing Worksheets. This series will look at the final consonant that completes Korean characters, and this series will look at the 14 basic varieties. Also all of the worksheets will use the vowel “ㅏ” (ah) as a base reference, this therefore limits the series to just 14 parts, otherwise it would be 140 parts long (as there as 10 basic vowels). 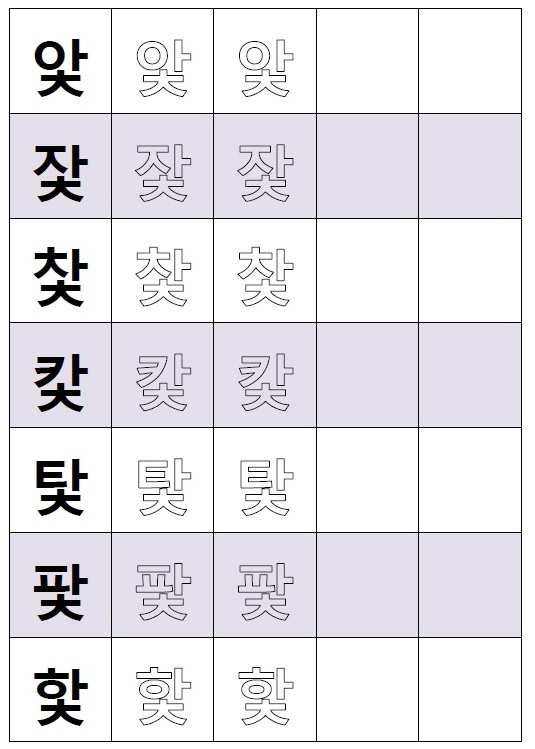 In this part 11 we will look at the final consonant “ㅊ“. This consonant sounds like an English “T“, which is different as if it where written as a primary consonant (which sounds like an English CH). A couple of examples of ㅊ used in Korean words are: 빛 – Bit (Light) and 낯 – Dong/Nyok (Clock Face). Thank you for your time and please come back soon for the next part of this series. 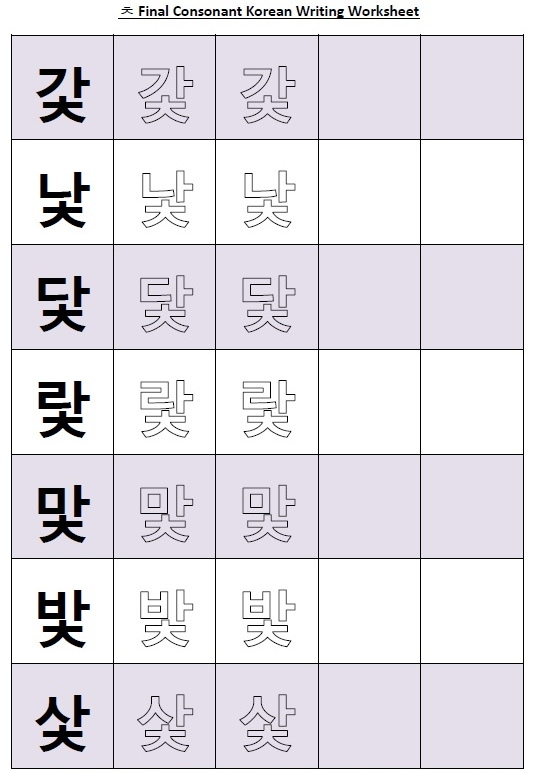 This entry was posted in Free Resources and tagged Education, FInal Consonant, Free, free korean, Free Korean Worksheet, Fresh Korean, Hangul, Korea, Korean, Korean PDF, Korean Worksheet, Learn Korean, South Korea, Writing Worksheet. Bookmark the permalink. I guess the link is taking me to another sheet.